Help us build the ultimate iOS and Android app for traders and collectors. Back our Kickstarter today! And we’re back for round by round MTGFinance coverage of the Top 8 matches at Pro Tour: Fate Reforged! Stick with us all day as we explore the potential financial implications of the early 2015 Modern metagame based on how the rounds play out. If Hornet Queen doesn’t win it, it’ll be about Tasigur. Love it. Hornet Queen may be the pivotal card in Game 3. Yes, in Modern. Wiergersma gets his combo early to take Game 1 in a hurry. Both remaining Abzan decks need to get past combo decks to win. Seems unlikely. Antonio Del Moral Leon gets one step closer to winning the first Pro Tour he has ever attended, and gives Splinter Twin a better shot at winning the day. Key cards from the Amulet deck for the MTGFinance minded include: Amulet of Vigor, Hive Mind, Primeval Titan. See our reviews below. Tasigur again playing a key role towards the end of Game 3 based on the ability to ensure attrition swings the way of he who holds the Bananas by recursing key cards. Jesse Hampton takes down the first match of the day, reducing to one the number of discard focused Abzan decks in contention for the win. Maelstrom Pulse top deck called out as the winning card for Jesse Hampton in Game 2. 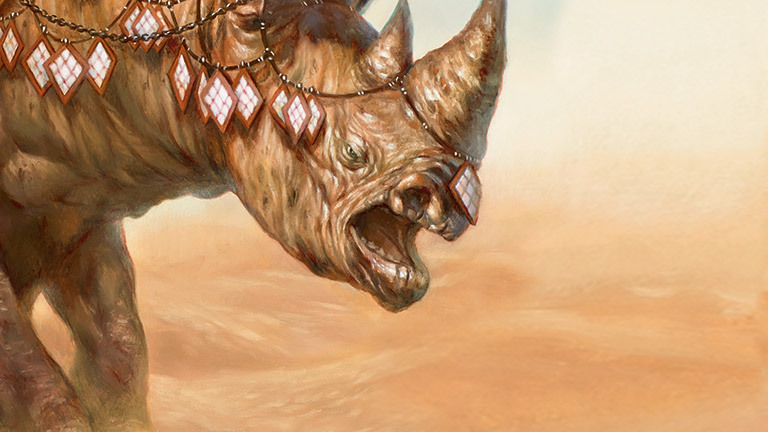 Siege Rhino and Tasigur defining the shape of this 1st game and highlighting the future of both cards in Modern and the strong likelihood that foils of both cards will continue to increase. EFro takes an easy Game 1 on the strength of timely discard. After 16 tense rounds of Modern and Draft, it’s all down to 2 Twin, 3 Abzan, 1 Bloom and 2 Burn decks. 12 copies in the Top 8! 4 months ago, very few players realized just how good this card was. Sure, the horned one was clearly set up as a major player in standard, but only the mad genius types had yet started testing this swingy and efficient creature for older formats. But then, a single copy started showing up in Pod decks and some of us started accumulating foils in the $10 range. Soon enough the Pod decks went to 4, but then Birthing Pod was banned, and the naysayers said it would fall of the table. Well, as it turns out, this card is plenty powerful in it’s own right and seems destined to have a long and storied career at the top tables in Modern for much of 2015 and possibly beyond. As a Khans of Tarkir rare in plentiful supply, 4-of demand from dual formats should keep the non-foil below $12 all year, but I like foils for continued growth up towards $40 on a strong finish today. This is the other Abzan staple with upside appearing as a 4-of in all three of the contending decks, for a total of 12 copies in the Top 8. The card already has a few reprints at uncommon, but only one foil printing outside promo versions, which gives it a shot to make a run for new highs if it takes a trophy today and stays relevant in the meta as a great way to present threats that are resistant to point removal. There are 8 copies of this creature in the Top 8, but they play against each in the first round. Tarmogoyf has hung out in the $180-$200 range for quite a while, and is unlikely to move much based on the results of this tournament. Rather, the issue will likely hinge on whether the card shows up again in Modern Masters 2015, a possibility I now peg at roughly 50/50. On the one hand Wizards would certainly like to see the price of the card come down as they had originally intended by their reprint release in Modern Masters. On the other hand, this means printing the card yet again, which may not have been on their mind when they went to the presses. I’m staying away. In the presence of the powerful blue/red Treasure Cruise decks leveraging Young Pyromancer tokens and the ability to shrug off discard spells, LOTV was sidelined. With those decks booted from the metagame however, Lilliana of the Veil has already started climbing back from her recent prices in the lows $50s. Folks who got in 6 weeks ago, are already facing 50% increases, with the card testing new highs around $85-$90 this morning. With a promo printing this spring, and no possibility of a reprint in MM2, only an outside chance of an appearance in M16 would be likely to stop the card from topping $100 again if she wins this tournament. This card was previously key to the dominant pre-bannings Pod Decks last season, but had fallen from $80 highs down to the current $55 levels on the assumption that Birthing Pod getting banned would hurt demand for the card in Modern. Instead we see 7 copies out of 3 relevant decks in the Top 8 and a chance for this sweet aggro/ramp creature to take home another trophy. Specing on this card is a short term play however as the card is very likely to appear in Modern Masters 2015 early this summer. Note that the card does not appear in the Jesse Hampton version of the deck, so pay attention to which version wins here. 7 copies of this card appear in the decks of the Top 8, but there is little doubt that this card can find a new high in the $15-20 range this year on consistent demand all the way back to Legacy and no reprints on the horizon. As the key element of the two Twin decks in the Top 8, Splinter Twin stands to benefit in the short-term if the deck takes the tourney. The mid-term outlook is muddied by a likely appearance in Modern Masters 2015 in June, which should hold the card down below $10 for a while if it’s reprinted at rare, which seems likely. At present, the card is hovering around $16, but it’s been as high as $35 last summer, and we should be able to retest at least $25 for a month or two if the deck earns another trophy today. Available for as little as $20 after it rotated out of Standard, Snapcaster Mage was always destined to be a staple in Legacy and Modern, but hit a rough patch when the sheer power of Treasure Cruise and Dig Through Time made delving the graveyard better than recasting it. With those two cards now banned in Modern, Snapcaster is again primed to succeed. The card has gained ground early in 2015 and is now hanging out around $35. However, as a card that will not be reprinted this year, and which fits into WUR Control and Aggro builds as well as Splinter Twin decks, there’s a good chance Snapcaster Mage can hit and hold $50+ this year. A win today could spark that fire. This uncommon staple from Ravnica: City of Guilds recently saw a reprinting in the Jace vs. Vraska Duel Deck but I still worry that it’s coming back again in Modern Masters 2 in June. Another printing at uncommon will make this a $3 card. As such, I’m selling, not buying, despite the key role this card plays in Splinter Twin and other viable Modern decks. Goblin Guide spiked to $40 last fall on it’s role in the punishing U/R Delver decks, but has since fallen down under $20, partly on the assumption of lessened play after the banning of Treasure Cruise, and partly on the assumption that the card will be reprinted in Modern Masters 2015 later this summer. A win for a Burn deck today (both are running the card) could boost the Goblin into the $20-25 for a short while as people move toward the deck to take down their local tourneys. Part of the strength lies in the fact that all of straight red, R/W and R/B versions are all viable in the metagame right now. Initially dismissed as unplayable, it didn’t take long last summer for Burn players to demonstrate that Eidolon of the Great Revel is likely one of the best red creatures of all time. The appearance of the card on the table puts Modern and Legacy decks on tilt given their plethora of cheap spells, while simultaneously providing a clock. Foils have already enjoyed a big jump in recognition of the play as far back as Legacy, but the regular copies are almost certain to follow a path similar to Abrupt Decay post-rotation, making them one of the best pickups on this list. I’m holding 60+ copies, and intend to pick up another 40 or so under $7. The last time this deck did well in a big tournament, it spiked from $2 to $10, falling all the way back to $3 after some of the early birds reaped some profit off the hype. This time, with the deck guaranteed a fresh Pro Tour Top 8, I suspect it will regain $10, and possibly push $15 if it wins. As a Zendikar block card, it is possible to appear in MM2, but there is room to grow before that point. Foils were bought out under $10 yesterday, and are likely to reappear this week around $25-30, depending on what happens with the regular copies. Titan was briefly a $40 cards during it’s most dominant period in standard, but post rotation it struggled to find a home in an older format, and has fallen towards $10. With a key role to play in the Amulet deck however, this beating of a ramp creature could easily challenge $15-20 if the deck wins and becomes popular in local metagames. Previous versions of this deck played less copies as their alternate win condition, but with 3 copies now becoming the standard, Hive Mind is poised to regain some ground towards previous highs in the $5-6 range. Foils are also out there around $10, which seems pretty solid right now, as this card is almost certainly not getting reprinted in MM2 due to awkwardness in limited. Splinter Twin wins, eh? So how long til WotC bans that? Can’t have combo decks winning events? Right Wizards? Good freakin call on the foil rhinos. I always thought the card was insane. Appreciate the heads up to grab em @$12. Got 8 and one Chinese foil.